I'm crushing on this jammy grape rhodolite garnet, from Tanzania. 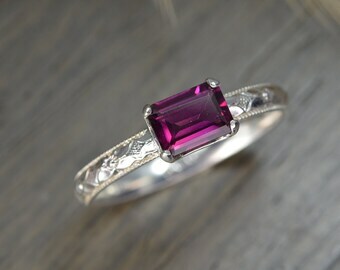 It's almost fuchsia, with rich cabernet undertones, infusing your favorite stacking rings with a bold pop of color. Or enjoy it as a simple, modern everyday solitaire. That's Aurora. Stack it with other Aurora Solitaires, or add a Duke or Luciano Ring! Message me for more pics and ideas, or info on the stone. The Aurora Ring is your new bestie, the companion ring to all your favorites, stacking perfectly with Blaze, Navette, Carmine, Luciano, and I love stacking a couple with Darcy. 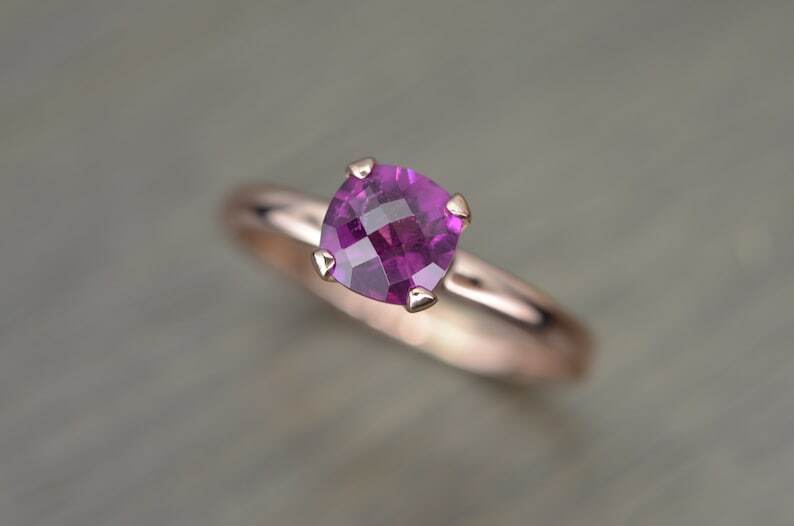 Available in top notch gems, Aurora adds easy luxe to your everyday rings in a flattering square cushion shape. 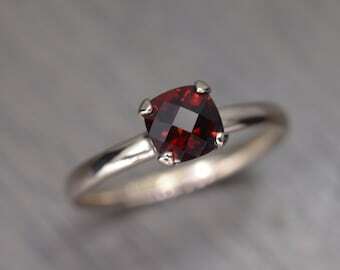 This listing is for one Aurora Solitiare featuring a jammy grape rhodolite garnet in a square cushion cut, with a briolette top. Made to order in half, whole and quarter sizes. Please select sterling silver or solid gold. Please include your size in the "note to seller" during checkout. In solid gold, sizes over US 8.5, please convo me prior to purchase. Refer to my shop announcement for current leadtime. - Stamped 925 /14k/18k and "Edward" on the 2.5mm wide oval 'comfort' band. - Gift-boxed with a small polishing cloth. A note about white gold: white gold is made "white" but the inclusion of nickel in the alloy, and should be avoided if you are allergic to nickel. Also, I do not rhodium plate my white gold jewelry, so they have the natural color of the alloy. In 14k, it is a natural winter white, and in 18k it's a champagne tone, like a washed-out gold. Please convo me for photos, if you're interested. If you prefer it to be plated, you can take your new Edward Owl ring to your local jewelers for plating. Your gift will be carefully wrapped in recycled pinecone printed kraft paper, tied with a shimmery black organza ribbon, and a jute bow. This ring was a favorite before it even arrived. 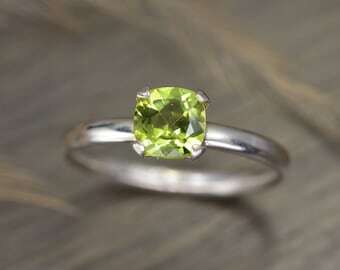 The grape garnet is a warm, wonderful color which blends well with the green gold that Holly used for the setting and band. 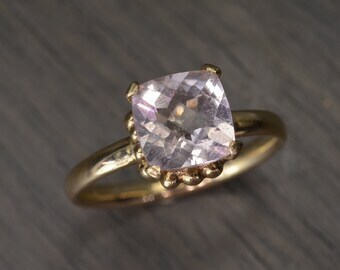 When looking for something special, as this ring is, I always look first at the EdwardOwl shop. Love it! So beautiful and sparkly. So very beautiful! Gorgeous gems and silver settings. The packaging was beyond beautiful and secure. Questions were answered, and shipping was timely. Fantastic experience overall! These earring are stunning and exactly as pictured but perhaps with a little more sparkle. Edward Owl accepts Paypal, Etsy Gift Cards, and all major credit card payments directly through Etsy. Payment plans, or installments, are not available. If you need to cancel your order, please do so within 24hrs of purchase. Orders cannot be cancelled after 24hrs. Don't hesitate to convo me before making a purchase if you have any questions, I'm here to help. 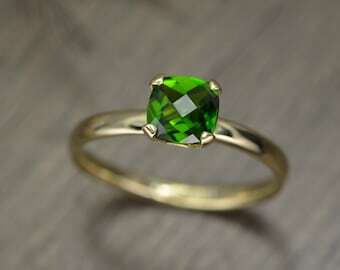 All Made-To-Order jewelry is considered "custom" and is a final sale item. 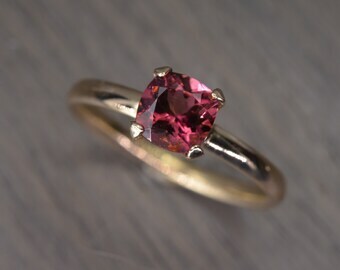 Convo me about gemstones, sizing questions, or to request additional photos, I'm always happy to help! Earrings are final sale, for hygienic reasons. I do not replace an individual earring from a pair. For ready-to-ship rings, necklaces, bracelets and pins, I offer exchanges only, or store credit within 14 days; no refunds. The item to be exchanged must be returned in re-salable condition. The leadtime for an exchange is the same as the new order leadtime, as per my shop announcement. Holiday Purchases or ready-to-ship items purchased in Nov/Dec can be exchanged thru the January 14th of the next calendar year. Please be conscious of your own physical conditions and ailments (like arthritis etc) and reach out to me if you have concerns about fit and suitability prior to purchase. Any repair work requires shipping to be paid for by you, the client, unless otherwise agreed upon. If there is a manufacturing defect, I will happily repair it for you, free of charge. However, if there are signs of inordinate wear, (a broken chain or a cracked gemstone, for example, is the result of direct damage) the expense to repair (if repair is possible) will be invoiced to you. PLEASE REFER TO MY SHOP ANNOUNCEMENT FOR THE CURRENT MADE-TO-ORDER LEADTIME. All ready-to-ship items ship in 1-3 business days. If you need something shipped same-day, contact me *before* you make your purchase. For items under $100, the shipping method is $3.25 for USPS First Class Mail, with tracking. Over $100, the method is $7.50 for USPS Priority Mail with tracking. Shipping Upgrades are available during checkout. Parcels under $100 are sent First Class International Mail, and over $100 shipped using both the USPS and Fedex. The method to legally ship precious metal and gemstones varies per country, for example the UK and Canada requires Fedex. Orders shipped using Fedex have weight restrictions; if you are purchasing multiple items your order may require additional shipping costs. Please convo me if you have questions about the shipping cost shown. Let me know if you need assistance calculating your VAT obligations. The gemstones in my work are 100% genuine from trusted sources, and chosen by me personally in Manhattan's Diamond District. I work tirelessly to choose the best rocks, balancing quality and cost. If you have questions about them, don't hesitate to reach out. As a designer & craftsperson, I am very connected with the gemstones that I select, therefore I handle & store them very carefully. Please note that all metaphysical properties listed are collected from various sources and are offered as a point of reference for those interested in crystals. They are not meant to treat/address/diagnose medical conditions. Most of my rings can be re-sized by a local jewelry repair shop near you. I can definitely help you find a laser technician in your area to resize your band, no problem! And I can stretch most rings around 1/4 size in my own studio, but otherwise I do not offer resizing. Why? 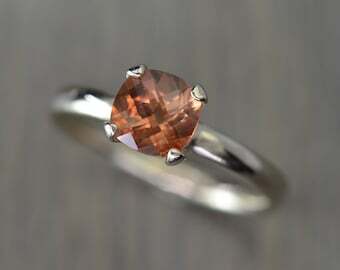 Most of my rings need a laser to resize them - once a stone is set in the ring, I cannot use my torch on the ring again, it will break the stone. Also making minor adjustments is more successful when you're right in front of the person working on your ring. If you are unsure of your ring size: when you place your order for a made-to-order ring, you can request to have a FREE ring sizer sent to you during checkout (USA only). For international clients: convo me to request a conversion chart. 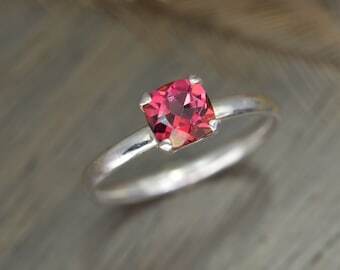 Carmine Rings are true to size. Even tho they might appear to be a "wide band ring," please order them at your normal size...or go up 1/4 size if you know that your fingers/hands swell up a lot or have *very* fleshy fingers. If you have very slender - even bony - fingers, let me know so I can size them a little snugger for you. Navette Rings, Aurora, Blaze and Cushion Solitaires, Victoria and Darcy Rings, and any other style you see with an oval "comfort" band will fit true to size. These bands are designed to feel good whether your hands are swollen a little or not. Luciano, Miro, Duchess, Duke, Candy, Elizabeth and Eve Rings have a flat band and will fit snugly. I soften the edges of these bands to make them comfy, but otherwise, they are there hugging your finger at the size specified. If you're on-the-fence about needing more room, I would order your regular size and have your new ring stretched locally. When your new ring arrives, and the size still isn't just right, most rings can be sized by a local jeweler. Convo me if you have any questions whatsoever about this, I am here to help!